The last decade has seen the rapid growth of biologics in the pharma market, making them a key sector to watch. With their growing popularity, it’s important to understand the opportunities and threats they present. Associate Consultant Ditte Funding takes us through how biologics are made, what makes them unique, and what it all means for pharma companies. The last decade has seen the rapid growth of biologics in the pharmaceutical market, making them a key sector to watch in the coming years. Biopharma made up 22% of big pharma companies’ sales in 2013, with this number being expected to rise to 32% of sales by 2023. With the growing popularity of these products, it’s important to understand the opportunities and threats they present to pharma companies. Associate Consultant Ditte Funding takes us through how biologics are made, what makes them unique, and what it all means for pharma companies. Before looking at how to manufacture them, it’s important to first understand what a biologic is. The definition of a biologic isn’t always clear, and what’s considered a biologic is constantly being updated and tweaked as new products are introduced to market. However, the broad definition of a biologic is they are created by either a microorganism or a mammalian cell, and are large, complex molecules; the majority of which are proteins or polypeptides. Examples of biologics include blood or blood products, gene therapies, vaccines, and cell therapies. There is a significant distinction that needs to be made between traditional small molecule pharmaceuticals (such as aspirin), and biopharmaceuticals. Biologics differ from small molecule drugs in their cost, production, administration, and clinical efficacy. Small molecule drugs are usually chemically synthesised, simple, and have a very well-defined structure. 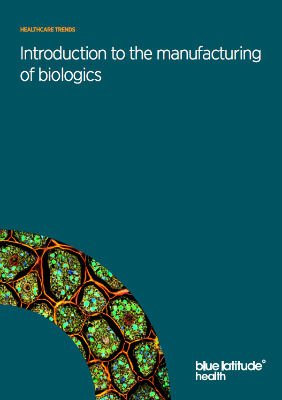 Whereas biologics, or large molecule drugs, are difficult to define and characterise. Biologics present great value, as they are highly specific molecules that tend to target more difficult to treat populations; it seems that biologics may become a primary tool for targeting hitherto untreatable diseases. However, in order for biologics to be widely used treatments in the future, they must be manufactured at the right cost and the right scale.